CT has become one of the most commonly used scanning tools for everything from emergency medicine to angiography. New technology continues to improve images and decrease radiation exposure. GE Healthcare continues to focus on dose-reducing CT options with its adaptive statistical iterative reconstruction (ASiR) technology, available on the GE Discovery CT750 HD and the LightSpeed VCT. According to Nilesh Shah, global chief marketing officer for GE Healthcare’s CT business unit, ASiR is designed to reduce image noise without compromising image quality. This technology has the capability to reduce dose by as much as 40% to 50% while maintaining image quality, he says. With ASiR, mathematics is applied to the raw data to create an image. Image pixels are measured, compared, and adjusted throughout the process, making a more accurate representation of the object being imaged, according to the company. This technology can be used on both helical and axial scans. GE Healthcare offers ASiR as an upgrade to customers using its LightSpeed VCT scanner. Another featured technology for GE Healthcare is its Gemstone Spectral Imaging (GSI), which uses dual-energy acquisition to provide incremental information that can help clinicians decipher pathological findings and get a clearer picture of a patient’s condition. GSI can help clinicians detect small lesions and offers powerful techniques to reduce metal artifacts, according to the company. On the horizon for GE Healthcare’s U.S. customers is new model-based iterative reconstruction (MBIR) technology called Veo, which is awaiting 510(k) approval from the FDA but is available in Europe. Compared with earlier GE Healthcare reconstruction methods, this technology uses modeling techniques designed to deliver lower noise, higher resolution, and improved low-contrast detectability and artifact suppression. While Veo is suitable for use throughout the body, the longer processing time with this technology means it is most likely not a solution for an emergency medical facility or a hospital’s emergency department, Shah says. The latest product from NeuroLogica gives CT wheels and makes it mobile. The BodyTom 32-slice, large-bore, portable full-body CT scanner offers advanced visualization and analysis tools in a device designed to move where it is needed. The BodyTom 32-slice device is not yet approved for use in the United States. Most CT scanners require a large dedicated scanning room to allow space for the table to move through the bore of the stationary device. They also need a source of electricity powerful enough to run the scanner as well as proper ventilation and HVAC cooling to keep the room at the necessary temperature. With the BodyTom, the CT actually moves over the table, requiring less space than a standard CT scanner. With that, Powell says, the only requirements are one small room with a hard, smooth floor and a standard wall power outlet. “Hospitals will be able to move the BodyTom CT scanner from their emergency departments to their operating rooms or even to the intensive care unit,” Powell says. In addition to its mobility, the BodyTom features an 85-cm gantry, allowing for ease of patient movement, and a 60-cm field of view. NeuroLogica's portable small bore 8-slice is being used in ambulance medical units in Germany. Accident victims or stroke patients can undergo scans at the scene or while being transported to the hospital. The 8-slice scanner is also approved and available in the United States. As part of its wide-scale Imaging 2.0 launch, Philips Healthcare conducted market research among radiologists to determine what parts of imaging and workflow needed significant focus. As a result, the company released a new version of its Ingenuity CT scanner designed to address clinical integration and collaboration, provide a greater focus on the patient, and deliver improved economic value. A key feature in this new version is called iDose4, which gives clinicians the ability to personalize radiation doses based on patient need. Jamie Valliant, senior director of global CT product marketing, explains that this next-generation iterative reconstruction technique allows for up to 80% less dose while maintaining high image quality, up to 50% lower dose with a 35% improvement in spatial resolution, or up to 68% improvement in spatial resolution at the same dose. Users can dial in the performance necessary for the particular patient they are scanning. Ingenuity CT includes a SyncRight interface with a contrast injector that allows clinicians to use up to 15% less injected contrast. In addition, the device incorporates a new user interface that is easy to use and includes more automation. These additions enable scans to be completed in about five minutes, Valliant says, which means hospitals have the potential to scan an estimated 25% more patients per day. Philips Healthcare also introduced its IntelliSpace Portal, which turns any PC into a multimodality workstation. While not just CT specific, this portal allows clinicians to work in a preferred environment, reviewing patient data without concern for the modality of origin. Valliant says IntelliSpace allows for total collaboration, not only among modality vendors but also within the medical community, with capability for more than one user at a time. With an eye to current economic conditions, Siemens Healthcare developed a number of productivity-related initiatives that result in processing more patients through a CT scanner without sacrificing quality of care. These efforts also include low-dose options that address patients’ concerns regarding overexposure to radiation. The company’s FAST CARE technology platform includes both dose-reducing and process-optimizing functions that operate simultaneously. Breaking down the two aspects of this platform, FAST, or fully assisting scanner technologies, supports process optimization; and CARE, or combined applications to reduce exposure, assists with dose reduction. Together, FAST CARE applications are designed to simplify workflows during scanning and in preparing image reconstructions. This new system automates many operating procedures, suggests parameter settings for image quality and dose reduction, and makes processes more standardized, which makes it faster and easier to reproduce results. The FAST technology includes a number of applications designed to support clinicians and radiology technologists throughout the CT exam process. FAST Planning, for example, allows for the standardized determination of the correct scan and reconstruction areas. FAST Cardio Wizard offers step-by-step instructions in the user interface to help operators with the complex preparations necessary for cardiac examinations. FAST Scan Assistant and FAST Adjust determine the appropriate parameters for performing CT exams with the best possible image quality. And FAST Spine can reduce the work involved in preparing for spine reconstructions, providing a list of predefined scan regions, determining the correct position of the plans to be reconstructed, and identifying all vertebrae and intervertebral discs accordingly. This feature is particularly helpful with emergency patients, accordingly to the company, when time is of the essence. The CARE technology includes several innovations. The primary innovation is the CARE kV, which is designed to help reduce dose by up to 60%. The CT scanner can automatically suggest the correct tube voltage depending on a patient’s anatomy and the organ to be examined. This further enhances the low-dose acquisition potential that can be achieved with Care Dose 4D, which modulates the amperage in real time. In addition, CARE Child enables CT examinations to be performed at 70 kV, enabling significant dose reductions for the youngest patients. FAST CARE will be available on Siemens’ SOMATOM Definition AS scanners in March and on the SOMATOM Definition Flash scanners in May. Toshiba refined its low-dose options within its Adaptive Iterative Dose Reduction (AIDR) software. AIDR is designed to reduce noise within images, improving visual quality while reducing radiation dose. The software is designed to improve an image by removing noise until an optimal image is produced. According to Joseph Cooper, director of Toshiba’s CT business unit, AIDR will come standard on the Aquilion Premium edition and Aquilion ONE CT scanners. The latest version of the software includes new algorithms that take into account whether a patient is an adult or a child in order to minimize radiation dose. AIDR will come standard on the Aquilion Premium edition and Aquilion ONE CT scanners. Helping hospitals increase efficiencies, improve workflows, and ultimately reduce costs are key objectives behind Toshiba’s introduction of 160-detector-row helical scanning. With this ultrahelical scanning, available on both Aquilion Premium and Aquilion ONE units, clinicians can image a patient’s entire chest, abdomen, and pelvis in less than five seconds, 2.5 times faster than 64-detector-row imaging. This enhanced scanning mode produces significantly less motion artifacts and produces high-quality images for more accurate diagnosis. Producing higher-quality images in less time helps ease the patient experience as well as improves facility workflow. As Cooper explains, containing costs while delivering high-quality, effective care is a directive of healthcare reform. With episode-based care as part of the reform mandate, many healthcare providers are uncertain about its effect on both patient outcomes and their bottom line. Toshiba America Medical Systems is partnering with healthcare providers to develop solutions to address episode-based care, he says, by effectively utilizing patient-focused imaging technology and a multidisciplinary collaborative approach to treatment. Cooper cites an example of a patient undergoing stroke care. With the Aquilion ONE, clinicians can conduct a noncontrast CT scan of the brain, a 4D CT digital subtraction angiography, and whole-brain perfusion in less than five minutes. Traditionally, he says, the protocol for this condition would include an MRI. However, this step can be eliminated with the whole-brain profusion CT scan. — Kathy Hardy is a freelance writer based in Phoenixville, Pa., and frequent contributor to Radiology Today. When looking at what the future holds for CT, it appears a truce was declared in the slice wars. The mission objectives are dose reduction and productivity. Nilesh Shah, global chief marketing officer for CT business with GE Healthcare, says the company abandoned the slice wars about three years ago, switching its CT energy to low dose, which he anticipates will be a “dominating CT development.” With public awareness and concern about radiation exposure increasing, Shah says many patients are questioning whether to undergo exams such as CT that involve radiation exposure. He believes patient reluctance could mean a loss of business for imaging facilities. One such solution could be model-based iterative reconstruction, which GE Healthcare is addressing with its latest low-dose offering, Veo. Currently available in Europe, Veo is 510(k) pending with the FDA and not yet available in the United States. Compared with other GE reconstruction methods, such as adaptive statistical iterative reconstruction (ASiR), Veo’s capabilities apply new modeling techniques to significantly lower dose and noise and improve resolution gain, low-contrast detectability, and artifact suppression. In addition to technology that improves image quality and lowers dose, Shah notes that manufacturers are working to improve productivity and workflow, considering big-picture solutions that address all aspects of the CT imaging process. He says imaging professionals will continue to look at steps for reducing the time involved from when a patient enters the imaging center through to postprocessing. Another CT vendor that abandoned the slice wars is Siemens Healthcare. The company’s CT marketing director, Murat Gungor, agrees the next few years in the industry will most likely be dominated by technology that supports productivity and dose reduction. One “preferred technology” he refers to is dual source, where a CT scanner runs two x-ray tubes and two detector units. This dual configuration can improve the characterization and differentiation of various tissues for greater visibility, according to Gungor. “Dual source is the leading technology when it comes to pediatric imaging, coronary CTAs, and dual energy,” Gungor says. “Dual energy is just another great way to positively affect workflow, and there is so much potential out there with dual energy.” Virtual nonenhanced images may be generated by the use of spiral dual-energy CT, he says. This technique could prove useful when only contrast-enhanced imaging is performed and further information of nonenhanced images would be necessary for validating the diagnosis in retrospect. With an aging population, Jamie Valliant, Philips Healthcare’s senior director of global product marketing for CT, predicts technology advancements in this imaging modality will be designed with chronic disease diagnosis and management. Philips is working to address this with its IntelliSpace Portal, particularly in regard to tumor tracking. This portal allows clinicians to work in a preferred environment, reviewing patient data without concern for the modality of origin. Valliant says IntelliSpace allows for total collaboration, not only among modality vendors but also within the medical community, with capability for more than one user at a time. Clinicians can monitor a patient’s cancer treatment by imaging tumors to see if they have reduced in size and to determine whether the current treatment is working or adjustments are necessary. “The industry needs to produce more tools like this, based on clinical collaboration,” he says. 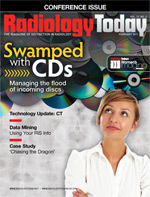 From a business perspective, Joseph Cooper, director of the CT business unit for Toshiba America Medical Systems, sees a change in the audience for scanners, with imaging centers declining in the market. He bases this predicted trend on the Deficit Reduction Act and cuts to reimbursements. He sees a trend of hospitals consolidating with and purchasing imaging centers, creating one larger medical community location. The medical challenges of dose reduction and improved image quality, plus the financial ramifications of changes in the industry, could bring about future technology advancements that drive the CT industry in a new direction.